Getting my two kids involved in cooking and baking is something I like to do. My children love making pancakes and even easier, making waffles as a weekend treat or as an after school snack. Character waffle irons in my kids’ favorite Disney character’s Mickie and Minnie Mouse or for the Star Wars fan’s Darth Vader (like my son) make it even easier getting the kids interested in creating their own yummy food. Even we as adults wouldn’t mind having a Mickey Mouse waffle for breakfast just like the ones you’ll get at the Disney world resorts, am I right? 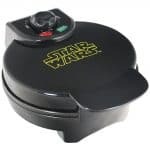 And who doesn’t know someone who would like to get a novelty waffle iron that makes an Avenger Captain America Shield Waffle or a Star Wars Death Star Waffle as a Birthday or Christmas gift surprise? 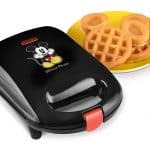 Besides producing a beautiful shaped image of your children’s favorite character, the waffle maker should be of high quality, durable material and safe to handle. We assume that you as parents will keep a close eye on your kids while they are baking waffles, depending on their age. My son is twelve years old and quite capable of making waffles by himself but his younger sister (seven years old) needs some assistance. We have found that most character waffle makers are reasonably priced with under $20 but don’t have the same features like “normal” waffle makers we have discussed in our guide to find the best Belgian and American style waffle makers. Features that are missing are two indicator lights and an adjustment for the temperature. We only found two waffle irons for kids that offer these features. The plates are not removable for cleaning either. It might be a good idea to have two waffle makers (if you have enough cupboard space that is); one for the special occasions like your children’s birthday(parties) and their baking sessions. And your favorite waffle maker that makes either thick Belgian or thin American waffles. In this table, you’ll find our top choices of waffle irons for children at a glance. For a short review, please scroll down. We do love the Avengers! And this waffle maker features four of the well-known superheroes! Make four square, thick and fluffy waffles featuring Hulk’s fist, Iron Man’s helmet, Captain America’s shield and Thor’s hammer and have a super cool start to the day. The Marvel MVA-281 is our clear winner for various reasons. Not only looks the outside very cool with the Avenger graphic but it also features dual indicator lights and you can control the temperature from light to brown colored waffles. Each waffle measures 4.25″ x 4.25″ and sure will delight your superheroes at home. This waffle maker has received some of the best reviews on Amazon. 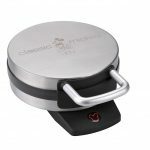 With its nonstick plates, it is easy to clean, and a cord wrap makes for easy storage. 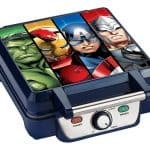 This Marvel Waffle Maker is the perfect gift for any fan of the Marvel comic series. 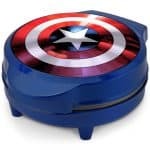 It is ideal for your aspiring superhero, and he or she will surely enjoy the thick waffles that look exactly like the Captain American shield. Why not have patriotic themed parties and gatherings? Whatever the occasion, a 6″ round waffle will be ready to eat in around 3 to 6 minutes. Some customers have found that the waffles are not cooked evenly. Otherwise no major complaints here. This appliance is a solid waffle maker for your superhero to be. Who doesn’t love Snoopy and Charlie Brown? 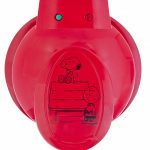 The Smart Planet Waffle Maker produces three waffles in three different designs at the same time: Snoopy, Charlie and the Little House. You’ll receive the waffle maker in a full-color gift box which includes a recipe booklet. The plates are nonstick, and the waffle iron is aluminum. You can expect to eat delicious waffles in 5 minutes baking time. Not bad at all! Now it’s time to plate up and put your favorite toppings on. My children love maple syrup, strawberries, and whipped cream. What is your favorite? Mickey Mouse is such a classic cartoon character and everyone, young and old, loves the adventures of Minnie and Mickey. What a fantastic idea to serve delicious waffles in the shape of Mickey for breakfast? The DCM 9 bakes mini waffles (size 4.5″ x 4.5″) in 2 to 4 minutes. A few customers experienced a long cooking time and weren’t aware that the waffles actually are small. Something to bear in mind. Breakfast just like at the Disney World hotel! Yeah!!! With the Classic Mickey Waffle Maker, this dream can come true. This waffle iron makes 7″ round waffles that look exactly like Mickey Mouse. Your children can decorate it in any way they want. How about some cinnamon sugar, chocolate sauce, and fresh blue -or strawberries? The waffles are ready in 4 minutes. Even the power light is shaped like Mickey. The brush stainless steel finish would look great in any kitchen. There are a few flaws with the DCM 1. Some customers have found that the nonstick coating comes off easily after a while. The waffles taste more like pancakes than thick, crispy waffles. In the same range, you can also get a 2-slice waffle maker and a pizza maker. As you can see in the photo, the 7″ round waffle looks perfectly like a Mutant Ninja Turtle. Super powers for breakfast anyone? The waffle maker works on 800 W, has nonstick cooking plates and a red indicator light. It makes rather thin waffles in three to four minutes. The outside of the waffle iron can get hot so be extra cautious when your children using it. The hinge seems a bit flimsy, and the waffle can stick to the plates. Overall, it is a great gift for any Mutant Ninja Turtle Fan. The Darth Vader waffle maker is one of the few novelty waffle irons that feature dual indicator lights and five temperature settings. It is made with stainless steel, and it stands upright for easy storage. The waffles have a more pancake like consistency. Some customers found that this waffle maker can take a long time to heat up. Overall, it is an officially licensed product and perfect for any Star Wars fan. 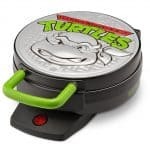 Our top waffle makers for kids sure will delight young and old who love the Avengers, Mickey Mouse, Start Wars, Ninja Turtles or Snoopy and Charlie Brown. Most of the waffle irons are very basic with only one indicator light and no temperature control settings. The good news is that they produce perfect images of the characters as promised. Our top choice – the Avenger Waffle Maker – offers red and green lights and adjustable browning control which is fantastic and should be standard for any waffle iron. Make breakfast a fun time, get your children involved in the kitchen and have cool or cute themed birthday parties. All this and more is possible with these novelty waffle makers. Please let us know what your favorite product is, and why? bestwafflemakersandmore.com is a participant in the Amazon Services LLC Associates Program, an affiliate advertising program designed to provide a means for sites to earn advertising fees by advertising and linking to Amazon properties including, but not limited to, Amazon.com. Amazon offers a small commission on products sold through their affiliate links.